Malcolm’s Smile, by Nep Sidhu, borrows from African graphic traditions to create symbolic representations of Malcolm X’s spiritual philosophy. When it arrived in our midst in 2014, the Aga Khan Museum unveiled a small but impressive collection of rare Islamic art in which an international connoisseur might rejoice. Yet, from the start, the Toronto institution has proved determined not to function merely as a fine setting for historical gems, and has also offered both a full calendar of live performances and temporary exhibitions that often feature persuasive modern work. To mark Canada 150, the museum now offers its first-ever show devoted exclusively to contemporary Canadian art. To program Here: Locating Contemporary Canadian Artists, guest curator Swapnaa Tamhane begins with one piece from the museum's permanent collection. 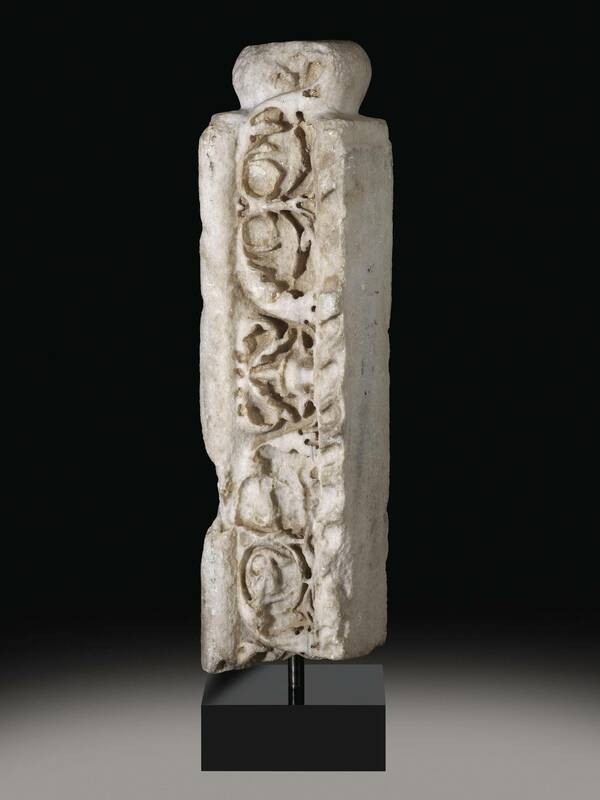 It is a marble stele not much bigger than a large loaf of bread, a piece removed from an ancient Roman monument and repurposed as a grave marker in the 10th century, inscribed with information about a deceased leather merchant in Kufic script – the earliest form of Arabic calligraphy. So, it's an intriguing example of cross-cultural pollination, mongrelism or overlayering that immediately speaks to Canadian multiculturalism. Tamhane installs it right at the heart of the exhibition in the museum's second-floor gallery, kitty-cornered to Babak Golkar's The Fox, The Nut and The Banker's Hand, 2016-2116, to create a wonderfully resonant juxtaposition. 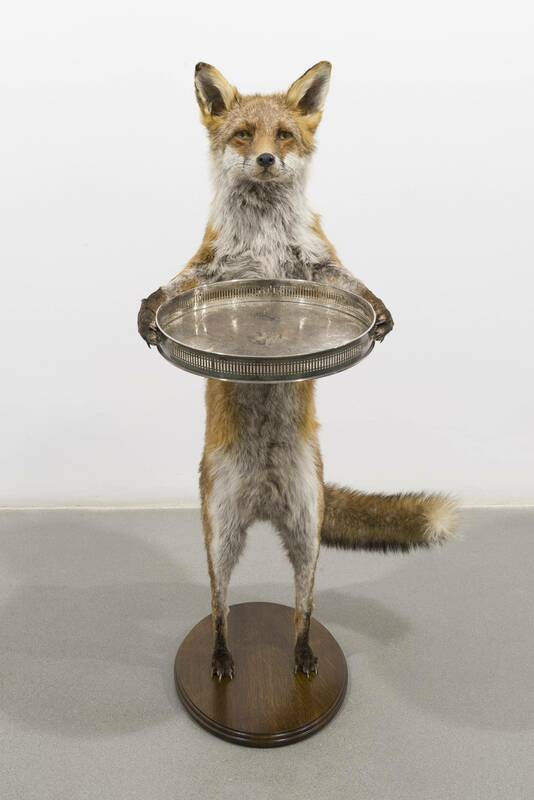 Golkar's piece features a stuffed fox, mounted on a polished wooden base like a trophy but standing on its hind legs holding an antique silver tray. Somewhere hidden inside this provocative creature there is another art work that will not reveal itself until 2116. The Fox is part of Golkar's time-capsule series including elements intended only for future generations. The work was inspired by the aftermath of 2008's economic meltdown; the banker's hand can be read as a reference to that greed-fuelled crisis, mocking Adam Smith's notion of the "invisible hand" of the free market where individual self-interest magically creates social good. Yet, in the context of Canada 150 and an exhibition full of work by variously hyphenated Canadians, the fox, a trickster figure in Indigenous and European cultures, also seems to speak to the settlers' experiment with conquering the land and subduing nature. There he stands, this wild animal apparently tamed, offering us the silver salver like a little servant, but leaving us with the uneasy feeling that he knows something we don't. What is it that the fox will reveal in 100 years' time? A blanket by Brette Gabel combines the techniques and styles of North American and Islamic cultures. From there the show progresses to a whole series of encounters between cultures and between this exhibition and the permanent collection on the floor below. Most visibly, in the mezzanine that overlooks the textile display from the permanent collection, Tamhane has installed the work of three artists that all speak to Islamic traditions of carpet-making. Sukaina Kubba offers us two shape-shifting latex curtains painted in pale sepia tones. Hanging above the display of lush robes in the permanent collection, they read initially as wall hangings, but they also can take on a rather industrial feel, such as rubber curtains in a hospital or a car wash. And, in another moment, they become a human skin. More obviously, Nep Sidhu's abstract portrait of Malcolm X in three woven hangings vigorously borrows from Africa's graphic traditions to create symbolic representations of the Islamic leader's spiritual philosophy. And, at the end of the gallery, Shaan Syed has painted three electric-coloured panels directly on to the wall, borrowing motifs from Berber carpets and tiles to create an installation that will be destroyed once the show is over. Ascent, by Jaret Vadera, is a video installation that transitions from muted to bright tones. This work, with its combination of the ancient and the contemporary and its emphasis on evidence of the artist's hand, is one of only a handful that could also be read as landscape, one marked by the human presence. For a show called Here, this exhibition is much less about place and much more about identity than the title might suggest: One of the few clear instances of hammering a stake into the ground is the work by Nujalia Quvianaqtuliaq, whose haunting pencil drawings recreate from memory and the imagination places in his native Cape Dorset. Not all the work is this evocative. Tamhane's decision to simply reproduce on a wall panel the text of the poem i have now seen … by George Elliott Clarke, about "an ancestral African" in his rocker watching over an abandoned landscape, is puzzling; it's the only literary work included in the show and, surrounded by the provocative muteness of visual art, its relative literalness does not sit well, as though the curator felt some need to tick various cultures off a list. Similarly, although it addresses Canada's relationship with First Nations, Jamelie Hassan's Could we ever know each other …?, a neon maple leaf rescued from an old restaurant sign in London, Ont., mounted over a reproduction of the $20 bill, feels rather emphatically national in a show about Here. The same artist's installation in the museum's little library, including a lovely yellow bench of Moorish tile inspired by one in Cordoba, Spain, and a collection of ceramic books, hovers much more delicately, evoking the magic libraries of the world. Tamhane has also engaged those books in an aesthetic conversation with work by Sameer Farooq, who creates white ceramic reproductions of museum-grade packing materials. There's a nice collection of them mounted in vitrines in the museum's lobby, a witty thought about how we prize and present art. Farooq is one of several artists included here who cleverly emphasize their own craft; another is Kahn Lee, who has filmed himself carefully carving a diamond shape out of a block of ice in Stanley Park as dawn breaks over Vancouver's port. Ice and rock, land and sea, the ephemeral and the enduring. Here, in a video playing just across from that reworked Roman marble, practice and place powerfully combine in an exhibition that is stuffed with rich evidence of the fertile hybridization under way in contemporary Canadian art. Here: Locating Contemporary Canadian Artists continues at the Aga Khan Museum in Toronto until Jan. 1, 2018 (agakhanmuseum.org).